Our ERP is targeting small and middle size enterprises. It’s good fit for project as well as product based companies. 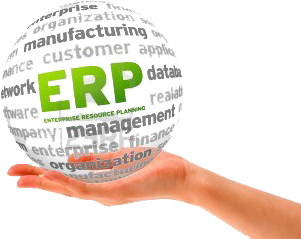 ERP will help you to integrate various departments in an organization. Easy access of data to authorized users of other departments which will help data integrity and consistency throughout the organization. After using ERP you will get strong financial control through proper accounting solution. You can have accurate scheduling by considering the lead-time of every product defined by the company so that you can have lowered Inventory carrying costs. In today’s dynamic business situation ERP will maintain a better Customer / Supplier / Sub-Contractor relationship.